Though bookmakers favor Pacquiao to win the fight with a 6:1 ratio. We could not discount that Mosley would give his all and whatever available in his arsenal to put up a good fight with Pacquiao. 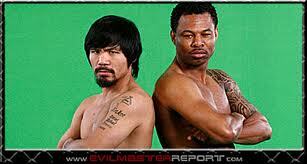 Mosley knows that he has more to gain and nothing to lose if ever he got an upset win over Pacquiao. If that happens, that would mean more financial reward to Mosley, now in the verge of retirement if he will not come out good with this fight. Pacquiao on the other hand will not allow this to happen that Mosley will prevail in this fight and that’s why he has trained like a horse which he has not done in her previous fight preparation. Most probably in the first early 3 rounds Pacquiao will gauge Mosley’s arsenal by testing his skills, speed and power and from there he can execute a game plan appropriate for the occasion. If Pacquiao can get past with Mosley’s power and speed and figured it out that he can sustain it in the early rounds, Pacquiao, most probably would engage early with Mosley, the same way he did to Oscar de la Hoya, Miguel Angel Cotto and Antonio Margarito. But if not, he has to wait starting from middle up to the later rounds where Mosley wanes down and become vulnerable. It is usually within this range where Mosley loses his steam as what happens to him during his last fight with Mayweather. Though there is physical size and reach difference between them in favor of Mosley, this advantages would be negated if Pacquiao apply those weird angle shots and lethal combination with speed and accuracy into Mosley’s head and body in coordination with his superb footwork to evade any counter-punch shots that is coming from Mosley. Added to that we can always expect a new version of Pacquiao in facing Mosley which has been touted by Pacquiao as the best fighter with skills, speed and power, that he has ever faced. To Pacquiao, his high regard of Mosley is not a hype but it’s coming from his heart that Mosley is a dangerous fighter. So he trains hard for this fight with a hundred percent focus. He doesn’t want to take any chances and treat Mosley lightly in the ring. Contrary to what other people believe that the fight is an easy fight for Pacquiao, with that said Pacquiao doesn’t want to get immersed nor be swayed such an overconfidence attitude into his system. Historically, he has learned a valuable lesson and already paid dearly because of overconfidence. His two losses in his early career is due to overconfidence, he went into the ring oozing mentally with overconfidence that he can do whatever he wanted inside the ring without any solid physical back-up of good preparation and hard training. The result were a disappointing blemishes in his record. Since then, he has not lost a fight because of inferior preparation. His third loss to Eric Morales is due to an aggravated accidental headbutt he sustained during their fight and not because of ill preparation and training. Pacquiao’s record speaks that after his Morales defeat which he avenged it twice in his favor he has not lost in 13 consecutive fights mostly with bigger opponents from there on. While Mosley’s performance in his last two fights with Mayweather and Mora both were a disappointment. Mosley’s reason for his poor performance was that he has problems dealing with defensive fighters. He is thinking this time that Pacquiao is much easier to handle because he is more of an offensive fighter than an defensive one, so according to him Pacquiao’s style would suit clearly to his style. What Mosley fails to consider that he has not experienced of what to be fighting a speedy offensive fighter like Pacquiao who could throw with accuracy 5 to 6 hard combination at a time with ease, then disappear. Would Mosley replicate the Cotto’s experience that it came to a point where Cotto would not know and wonder where those hard punches come from when he was in the ring with Pacquiao? Will Mosley be of the next member of the hall of ill- fated club of De la Hoya, Cotto and Margarito? That’s something we want to see on May 7th. 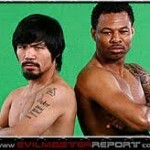 Now, whom your picking Pacquiao or Mosley?